Once you pick your element, you may be a bit confused as to what to do. Let’s begin by explaining levels. Leveling is how you unlock new moves. As you progress you will unlock a variety of new and exciting abilities to add to your arsenal. You can find a complete list of all moves, what they do, and what level they unlock here. You begin at level 1, as is standard. You increase this by fighting mobs in dungeons or fighting mobs in Spirit Capture Points. Normal mobs that spawn in the overworld will not give experience towards your level and neither will PVP. The max level is 25! Your level will always be displayed on your screen above what is the experience in normal Minecraft and what is the energy meter on our server. Leveling up is an incredibly simple process. As mentioned before, you fight in dungeons or spirit capture points to gain experience. You do need to pay attention to the level range listed on the dungeon’s wiki page or displayed in floating text at the dungeon’s location. If you are outside of the level range, either below or above, you will receive significantly reduced experience for completing it! You can find a more in-depth list of our dungeons here, including level ranges, rewards, and exact locations. If a dungeon has a level range of 8 to 13, you must be level 8, 9, 10, 11, 12, or 13 to receive the full amount of experience. Once you reach the level above the max for the dungeon, move on to the next! 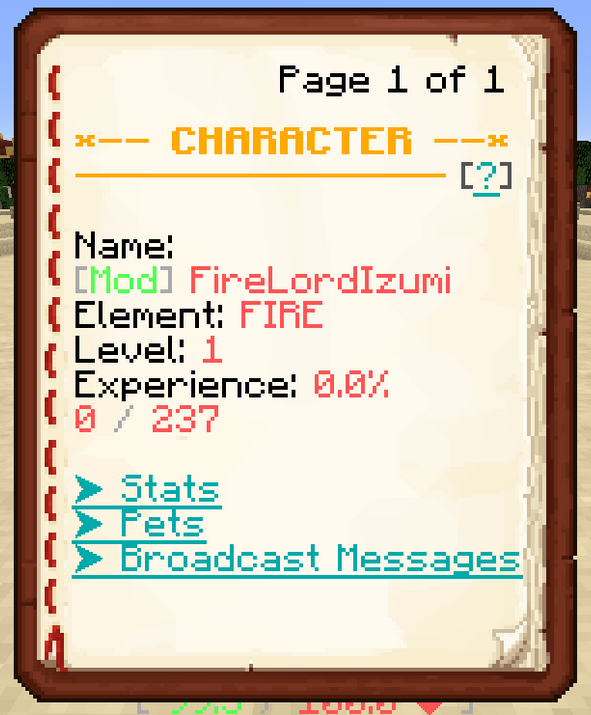 At any point, you can execute the /c command to view your level, see your experience, view your stats, view your pets level, and edit broadcast messages. 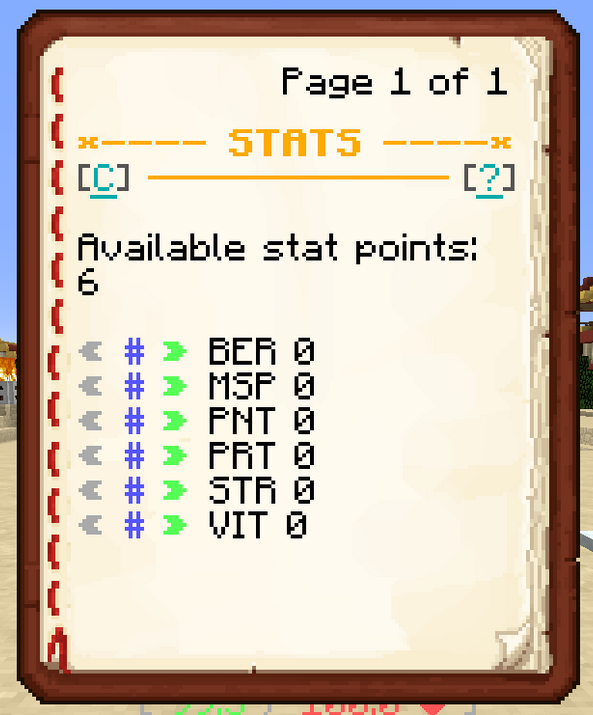 For each level, you are given 6 stat points to put into your stats of choice. At level 25, you will have a total of 150 stat points. These stat points are what makes you stronger - if you neglect to use them, you will find yourself dying in dungeons because you are simply too weak to kill anything. 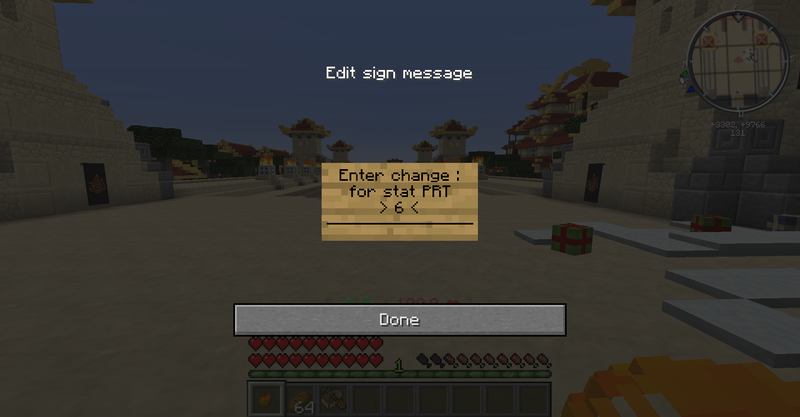 In order to allocate your stats, execute the /c command in chat and click on Stats. Here you will see a list of 6 different stats, each with different benefits. BER: Bending Energy Regeneration - Makes you regenerate energy faster after casting a move. MSP: Movement Speed - Makes you walk and sprint faster, will also make pets when mounted run and swim faster. PNT: Armor Penetration - If you are fighting an opponent with a high armor stat, doing this will make a percentage of your damage bypass their armor protection. PRT: Armor Protection - Gives you a percentage of armor at all times to negate some of the damage done against you. STR: Strength - A flat percentage increase of your damage across the board. VIT: Vitality - A flat percentage increase of your health across the board. In order to allocate your stat points received from each level, either click the > to increase each stat by a single point or hit the # to type in the amount you want. < will be available only BEFORE you hit confirm. Once you hit confirm, you will not be able to remove stats unless you go to the vendor in the Tree of Time that sells Stat Resets. Once you reach level 5, you gain access to the ability to reset your stats. In order to do so, you must venture through the Northern or Southern Spirit Portal and enter the Tree of Time. Once there you can talk to the NPC in order to purchase an item to reset your stats. This requires 2 tea leaves to purchase, so if you don’t have those, check out the numerous tea leaf guides in the Guide section of the forums. This item looks like a compass. With the item in your hand, right click with it to reset your stats. You will keep all your stat points, this is just so you can re-allocate them! You do NOT want to put an equal amount of stat points into every stat. This might sound well-rounded initially, but because there is only 150 points total you will not receive that much of a noticeable buff from putting 25 into every stat. You want to focus on one or two stats for a «good» build. Maybe three if you are feeling confident in your abilities. If you are still doing dungeons, it is advised that you put all stat points you get into STR (Strength). This will make every bending (even Air) capable of doing high enough damage to clear dungeons quickly and easily. Once you are finished with dungeons, certain stats benefit certain elements’ playstyles. Fire benefits from both Movement speed and strength as it is already a hard-hitting element, while movement speed allows you to dodge attacks while maintaining a close proximity. Earth benefits from Armor and Strength as it allows them to tank hits and deal large damage. Water benefits from Vitality the most of all elements as a large health pool paired with Healing abilities makes them virtually unkillable. Air benefits from Movement Speed and Energy Regeneration as this allows them to spam attacks at a range and evade attacks with ease.